Ruby Wax is a funny woman. During her successful comedy career she battled depression in silence. Now her work blends mental health advocacy and comedy. Winston Churchill famously called his depression “the Black Dog”. 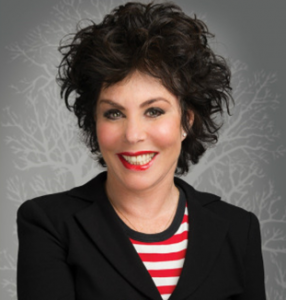 Ruby Wax knows the Black Dog well; throughout the ’80s and ’90s, during a flourishing career as a brash comedian and interviewer in the UK, it trotted at her heels, even while she was interviewing the Duchess of York and sorting through Imelda Marcos’ shoes. After taking a timeout to learn how to manage the condition, Wax produced a stand-up comedy show called “Losing It” that directly addresses her mental health experiences, hilariously but powerfully. And she’s started up a new social network called the Black Dog Tribe (now run by SANE UK) that offers an online community and support to people with depression. She’s also written a book on mindfulness and depression. So here’s our shout out to Ruby Wax, a wonderful woman taking a mental health disorder in her stride, if you can’t laugh about it, what can you do! Check out her Ted Talk here and have a laugh!